Mycelial: Street Parliament. A Document in Layers of Collaboration. for a better idea of what i am talking about here, come see Mycelial at Hyde ParkArt Center this weekend. Hi. If you have read any of my blog posts in the last few years, you know that I have been a bit quiet lately. There are many reasons for that, and maybe I will get into all of them at some point (not quite ready). But something coming up has me breaking the silence, if only because the trajectory of it has been the landscape of the last 3 years of my life and now it is finally seeing the light of day. Mycelial was concept proposed 3 years or more ago by my long time collaborator Erica Mott. It started with an email asking for some language regarding what I would do with a big data set like all the tweets in #Egypt, #Occypy, or #BLM, to create a sound score. I think I made up something quite elaborate, if not slightly general, for a grant application, but inside my mind, my answer was really “look for help” as I really didn’t have the first clue. So Erica started doing her magic of finding the right people and putting us all in a room together. Some of those rooms were physical, but many were virtual. These included programmers, cell phone app designers, user experience and VR game designers, activists and organizers, and communications scholars among many others. When the grant application transformed into a project, and then the project was suddenly supported by the US Embassy in Cairo, the group of collaborators became bigger. We became very focused on one particular dataset (#Egypt) which was the hashtag used by the protesters in Tehir square. And we started working with lots of Egyptians. As the team grew in Chicago some very creative and tenacious people at the US Embassy in Cairo proposed a very integrated cross cultural collaboration in which each US collaborator has an Egyptian counterpart. 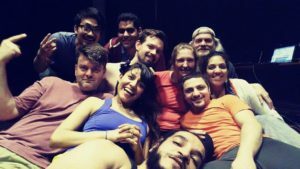 The next thing you know, we were embroiled in a series of residencies in Chicago and Egypt that was to culminate in performances in Cairo, Chicago. It seemed like a dream come true for us with solid support from a strong cultural institution. Of course, a sudden change in leadership in Washington left the US State department in total disarray. The subject of another blog post all together, but I would say we were possibly some of the first casualties of the trump administration. But there we were. Now many eyes from many different disciplines were staring into the void of 12 million tweets in an excel spread sheet that was bigger in file size than most audio files on my hard drive. 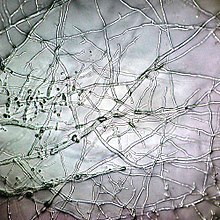 The name Mycelial refers to a living network of fungal strands that connect vast forest floors. Research has shown that these strands become almost like neural networks sending messages across great distances connecting the forest and helping it thrive. The analogy being explored here is that social networks, and social media have become a form of neural network for large movement and social movements and that something about the ebb and flow of information across the globe has helped them thrive. But there are invisible layers that might not be so obvious and the question of what those layers are and represent is kind of the bigger question being posed. So we started with the a dataset to ask that question. What does it mean to make music or to make dance from a dataset? What would one expect to extract from it and what is the human meaning of such a large swath of information? From what angle do you approach this kind of data? Of course, nobody can possibly really “see” what 12 million tweets really means just by reading it. It’s not like reading a novel or a poem and then using it as inspiration for music. After several conversations with creative coders and programmers, we had several methods and ideas for things we could do to directly “auralize” different aspects of the feed, but what we found was missing in all of these approaches was a way in which we could reflect the emotional content hidden in the millions of individual statements being made as well as how those emotions spread over the glob as they were “re-tweeted” over a series of social networks. Don’t worry. We found a solution. It had many caveats, but before I get into that. I wanted to talk a bit about the amazing people involved in the project and the incredible contributions they made. Hugh is the glue and in many ways, the backbone of the project. 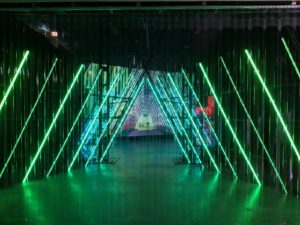 A strong audio and visual installation artist, we met when he created the walk in installation for 3 Singers at the National Museum of Health and Medicine. One of many things in that project that I mercifully had very little hand in, it was not until after the project was done that I got a chance to really get to know him. He acted as user experience designer for both live performative instruments used in the piece as well as audience driven installation elements. 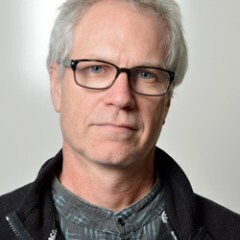 But more than that, he also spearheaded the analysis of the dataset we used, wrote hours and hours of code that allowed phones to talk to projection, and devised method for audio visual interaction based on ideas coming from the entire group. 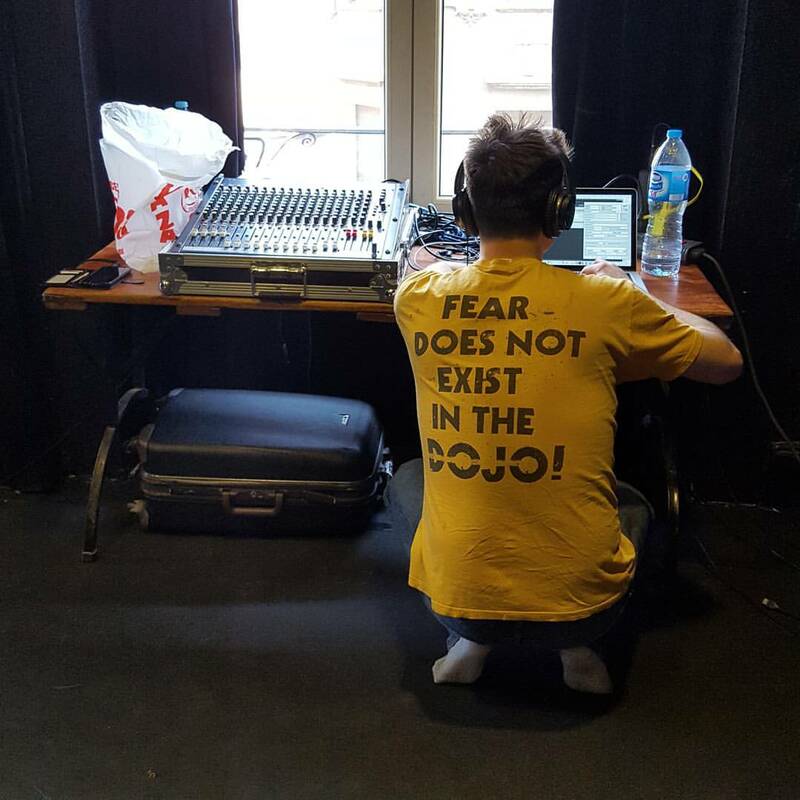 It was Hugh that managed the team of Egyptian collaborators who helped develop visual content and he was a general sounding board for almost every aspect of the piece. I feel very fortunate to have met him and worked with him. His energy is always positive and he is always willing to try almost any crazy idea. the support of the other two in a quiet and respectful work environment gave us the combined brain strength to overcome the many hurtles that were needed in the crafting of the various technological instruments. John was kind of our spirit guide often just turning us on to a piece of code or something we had not heard of or giving us access to things we would not have otherwise had, (including getting different university professors to answer our emails). Clearly loving to be identified by his distinct style of projection art rather than his physical presence (I could not find one picture of him online but lots of his art), Liviu developed and integrated the video imagery that was collected by many participants during 2 trips to Cairo and several trips to the internet. He has also been instrumental in integrating and coordinating the many visual cues with the sound score and cell phone input as so much of it happens in tandem or interdependently and his challenge became to make all of what was being input in the phones fit to the multiple projection mapped space as the piece unfolds. Then there was the Egyptian team of technicians and programmers that worked with each of the above artists. 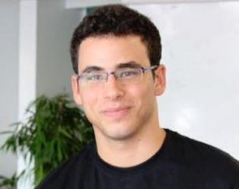 Ziad Osama (programmer) is an undergraduate studying Computer Engineering at the American University in Cairo. Ziad is an engineer by day; a creative coder by night. 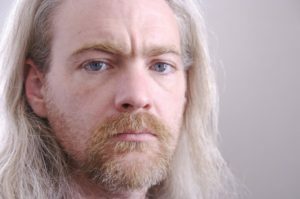 He found his passion in computer vision and interactive artworks. What is art without engineering and what is engineering without art, Ziad wonders. He also cofounded Creative Coding Cairo. 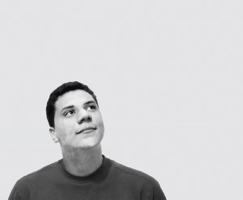 Badr AlKhamissi (programmer) is a developer/artist/ researcher hybrid in the making. 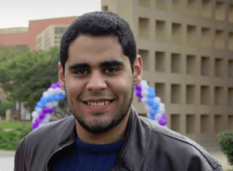 He is currently a Computer Science senior in the American University in Cairo. 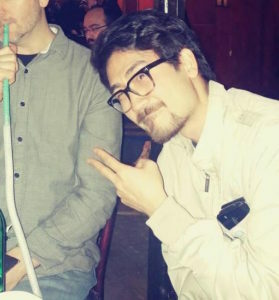 Passionate about Machine Learning, Computer Vision and Creative Coding, Badr worked on several projects that focus on the overlap between Art and Technology. He is a cofounder of the Creative Coding Cairo Community. This creative team of technical artist all worked together to make almost every aspect of the piece work from creating and editing content to writing applications that allowed the phones to send images and text to the screens, perfecting the motion capture systems that allowed the dancers to control the sound-score and visual landscape with their body, or interpreting the dataset we colleted along the way, there was really no part of the piece that did not involve 2 or more of the minds on the list. When thinking back on all of it, my mind is literally boggled and given how many ideas were tried that did not make it to the piece I believe we may have a library of code to mine for future projects that will help generate new work for all involved down the road. In today’s world of easily networked programming it was not hard to send messages to one another across closed networks. But what WAS challenging was getting the various programs, computer languages, and ways of thinking about the material being used to actually make sense and work together. How do you create a unified artistic vision that gives direction and meaning to every part? How do you get systems that are developed in disparate quarters of space and time to suddenly come together and accomplish a certain goal? And at what point does the digital scotch tape begin to fail holding it all together and what is left when that happens? It is true that the people working on this project together all work at a high level in their own rite, but finding the commonalities of working process was almost more pointed in this case than working with different types of performing artists or collaborators in non-technical fields. I many collaborations, even artists that do not share a spoken language can come together by showing each other what they do. In coding, it is often a bit more esoteric as you are creating something out of something that cannot yet be visualized or heard. Though many people use similar programming languages, there are different ways of thinking and different conventions that result in different kinds of art. It is almost like within the creative coding world there are different “genres” that have different tools and conventions that everyone in that genre knows. I guess you could say, they are different cultures. So how do you get different cultures to come together for a unified purpose. If this seems to have a familiarity to the subject matter at hand, it was not lost on the creative team. Our process was eerily similar to the social movements we were investigating. We all just kind of showed up one day and started occupying spaces together. Rehearsal halls, living rooms, storage closets in the back of computer science departments, common areas in our hotel rooms, bars, restaurants, and coffee shops. We met in pairs, trios, quartets, and large groups. We worked hard together and tried to understand one another, but also tried to celebrate the fact that we could just be together and have the freedom to create. But at the same time we were following many threads. I was practicing and editing sound score with the dancers while simultaneously troubleshooting body tracking cameras and trying to get the sound to work. Hugh would be up on a ladder or piece of scaffolding while simultaneously giving notes on something being projected on a screen. Tony, Badr, and Nassir would be huddled around a computer screen trying different things on their phones while I would be sending Tony files to plug into the cell phone software, all the while, Erica would attempts to keep focus and shape and craft the choreography while trying at the same time to understand and visualize something that was going to be on the screen. So, if this sounds a bit like a circus, it actually really was. But the more I have heard about the environments on the ground in many a bygone social movement in the US and around the world, it all sounds like that. People who have never met just show up and try to organize in a place. They are from different backgrounds and have often very different reasons for being there but have decided to unify for a singular moment to fight for what they believe. Often these kinds of movements are allergic to centralized leadership. And in another sense, though many are sure of what they are fighting against, it is not always so clear what they are fighting FOR. Only that things can be better. And so in this sense, we were together. A tenuous group with so much creative energy poring forth and a spiritual vision of what we were making (notwithstanding the many multi-layered google spreadsheets we had created to try and turn that spiritual vision into a unified reality). So, how do I describe this work? Lets start with the different parts. To me, this piece was like building a new genre or ensemble more than just making a piece. We know what an orchestra is and some of us know what a Baroque orchestra is or a classical or modern orchestra is. We know in general what a Jazz combo consists of and what a standard 5 piece rock band is like. But we don’t have much of a handle on what parts make up the multi-media performance ensemble. So in the case of the cameras, it starts with Erica, myself, and the dancers. We started developing the body tracking system years ago (in preparation for 3 Singers). Once certain limitations of the system I had developed were identified, Hugh Sato began to develop more sophisticated modes of tracking using different kinds of cameras (Kinnect v2, web cams, and finally, IR security cameras). That technological hurtle took many years and was developed in tandem with the development of the work so it is hard to really state easily what came first. But I should first talk about the performers involved. Chris Knowlton, Carlos Lopez, Nejla Yatkin are all dancers who have been with us developing the piece and even travelling to Cairo and taking part in other residencies. The 4 dancers that have participated and are now performing in the piece actively, Sylvita Diaz-Brown, Mounir Saeed, Ezzat Ismeal, and shaymaa shoukry. 3 Are Egyptian dancers from Cairo, and one is a Chicago based dancer and performance artist. I have developed a more than usually intimate relationship with this group of performers. As is normal with my work, I have tried to develop moments where the performers and I (as an electronic performer up in the heavens) find ways to breathe and express as one. In this case, a series of motion tracking techniques have been used to turn their movement into sound starting with some techniques I had developed for 3 Singers but ended up on the cutting room floor and ending with a brilliant system developed by Hugh Sato incorporating 4 security cameras to give each dancer their own “zone” on stage that responds to their overall velocity in any direction. Because it is the overall velocity measured by changes in pixel movement across an X/Y plane, it is actually important that their whole body be engaged. The more of their body that moves (from the core) the more it invokes the sound that it is controlling. This requires a very different way of moving and a very different way of thinking about a composition. Really you are creating structured improvisations for dancers who are trying to evoke a particular emotion. They have to feel where their body creates stillness and where the boundaries are. 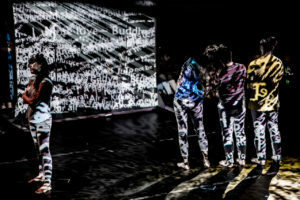 This process requires a dialogue between the electronic performer and the dancer that is often quite non-verbal but more based on the connection between the eye, the body of the dancer, and the musical instinct of the performer. It can be an extremely frustrating connection to make as it can be difficult to get the different reactive parameters that can be adjusted to their “sweet spot” for each dancers depending on the light, the height of the camera, and the specific way in which they dance. It is easy to give up home and simply say “this thing isn’t working”. But it is also a challenge to perfect the technology itself and find the balance between learning and perfecting the instrument as it is and finding those one or two tweaks that will make it do what is desired. Figuring out what is desired can also be a hidden factor in the process that is less easy to define. The fact that we went through 5 iterations of the system over the course of 3 years says something about this challenge. It is also a creative struggle. I don’t love to use the word struggle when it comes to creativity, but lets face it, all collaborations can be a struggle. Those that have followed our work together (Erica Mott and myself) have likely heard the word “inter-dependence” over and over again. This term is really one that could apply to almost any multi-disciplinary collaboration. Any time you are creating choreography that goes with music, you create a form of interdependence. The way the choreography will unfold is dependent on the nature of the music, but at the same time, what the music needs to do is dependent on the needs of the choreography. Often times, it’s just so much easier to choreograph to a known or found piece of music for this reason. It just keeps the conversation more simple because it isn’t really a conversation. But when you are creating something specific, there is always a kind of game of chicken going on as to who makes the first move. Often times the choreography needs something to get it going but without knowing the full choreographic idea, it is hard to gauge what is the best strategy. All we have to communicate the vision at this point is words. Words always fail us. Over time and many revisions, the vision becomes more clear and, in a good collaboration, it becomes easier for the participants to work efficiently and effectively as they see where it is going and start to “breathe” together. Now imagine adding a human body as a shared resource to the equation. In this case, the body is not just reacting to the music, it is actually shaping the music itself. The body itself becomes a musical instrument, but at the same time, it must serve the choreographic purpose. This takes time. It also takes the total buy in of the performers and lots of patience on the part of the performers, choreographer, and composer while they discover the artistic possibilities of the interactive instrument from which the movement material will be crafted. In this sense, the art of “composing” the sound score and choreography is more about shaping and guiding improvisation than about dictating movement. The whole point of interaction in this way is to give the performer a creative palate to work with and then some guiding vision and idea with which to craft their individual relationship to the material. Being clear about that vision while at the same time giving the performers freedom to express themselves within it is supremely difficult and takes time, energy, and empathy. It also requires technical empathy. The technology itself will always provide hurtles, even beyond frequent failures as the technology is developed. It is often not clear when the next steps require more practice and new ideas, and when a real shift in the way the technology works is required. This path can be clouded by desire and emotion just as much as it might be clouded by some aspect of the technology not working the way it was intended. Sometimes the technology is working as it was intended, but some confusion over “intention” muddies the waters. When working on the edge of a field, even a small change can take hours upon days of re-programming. If all involved are not prepared to pore themselves into what they are trying to achieve, it can easily fall to pieces. I know it seems I paint a tenuous and bleak picture of how the process unfolds, but I am just trying to demonstrate to the reader some of the skill, patience, and empathy that has to go to achieving what in the end hopefully seems quite simple and effortless. And when the process has been traversed by all involved, it truly can seem like magic. When I see and hear what the dancers do in this performance, it really does seem like magic to me. And just like any ensemble, we have to warm up together before every show for the magic to really unfold. I have found that on performance days when other technical or logistical elements don’t allow us to warm up together I feel more frantic and the performance seems a bit more forced. On days we do get a proper warmup, it feels like we are able to go farther expressively because we are all more comfortable and confident in the space we are in. If that sounds the same as preparing for any performance, it is. It is this that takes our “technological instrument” out of the virtual world and makes it real. As Hugh developed the camera technology to interface with my sound generation patches, he was simultaneously developing all kinds of visual reactions that reacted in similar enough ways to how the interactive sound score worked that the same gestures would create a visual as well as a sonic reaction. I think in some ways he always had this in mind as he was developing the technology and in the end it is one of the most consistent and successful parts of the production. It is also one that I believe sets an amazing foundation for future work. The way we used the dataset we ended up focusing on really set the tone and tempo of the early parts of our collaboration and set the foundation for the structure of the entire piece. Really the entire collaboration started when Professor Zizi Papacharissi gifted us with an excel spreadsheet containing identifying information for 12 million tweets containing #egypt, beginning January 25th 2011 and ending a month later. There was so much to interpret in this dataset that it was really overwhelming at first, so we had to enlist the help of people who analyzed and interpreted datasets as a part of what they did. We were fortunate to have some help from some very talented computer science students at UIC who formulated a “question” to ask of the dataset using a Tone Analyzer algorithm. We asked, “what are the average levels of 4 emotions (Sadness, Joy, Anger, Fear) over a 6 hour time period throughout the duration of this dataset. What came out was a chaotic mess where at first glance, it seemed all emotions where close to equal the whole time except one very obvious “spike” in joy right around February 8th. If you look up the history of the movement associated with #Egypt, you will clearly see why. But once we started to look more closely at the spikes of data and scaling them so that the minimum levels were placed relative to the maximum levels for each emotion, it seemed very apparent that all of these emotions were fluctuating all over the place. It also seemed apparent that these levels corresponded to various events during the 30 day occupation. It is at this moment I would like to introduce to you, someone who has become my dear friend over the course of 18 months working together on this piece, co-composer, and accomplished electronic musician Ahmed Saleh. Ahmed is a very well known electronic composer in the Cairo experimental electronic scene. 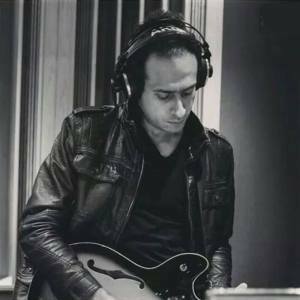 His music has a sensibility to popular Egyptian music forms and has a danceable quality as well as being created in collaboration with so many different traditional musicians across Egypt and elsewhere in the middle east. He is a wealth of knowledge regarding those musical forms but also a great performer and electronic improviser. When Ahmed came into the project, I we already had the form and structure that had been given to us by the emotional analysis of the dataset, but I was really struggling with the content with which we were occupying that structure as well as how to best think about its progression. It was the infusion of his sensibilities and knowledge that really make this all start to come together. Over many conversations on the balcony of the Om Kolthoum hotel in Zamalek, we talked, drank, listened to music, and formulated a plan. In doing so, we became close friends and, I hope, we will continue to collaborate after this project is done. After we got a set of numbers from the tone analysis algorithm, I sat and stared at the list for a while. As I mentioned before, it took some scaling and filtering of the numbers to help ascertain more meaning from them. This is in data science referred to as “filtering out the noise” as it were. Other scientists engage in another similar technique to help clarify experimental results involving large sets of data called “reparametrization”. Now where have heard that before? Once we were able to see the data more clearly, it seemed to me that there was a particular musical arc at work. It almost seem to ebb and flow in the way an all-night dance party might with small peaks here and there culminating in a really big blowout around 2/3’s of the way in. Coupled with the fact that so much of Egypt’s cultural music and so many of the social movements we had encountered had so much to do with “dance” culture (weather street dancing or electronic dance music culture), it seemed obvious that this score was somehow going to have to be fashioned like a dance party. With DJ’s. Ahmed and I both hate it when people call us DJ’s. But here we were none the less. Trying to be DJ’s. In this case, we were actually trying to get the dataset to act as a DJ. After months of carefully curating samples that not only had some significance to use symbolically and musically representing the 4 emotions AND sounded good together, we started to create different “sample banks” that mapped to different levels of the different emotions. So when fear was off the charts, there were lots of “fear” samples, and when we reached the huge spike of joy, all the joy samples happen together, etc.. Though we spent lots of time crafting samples so that they came out in pleasing combinations, we tried to stick as close to the dataset as possible. This is how the whole arc of the piece was developed and Ahmed and I explored and excavated the different dance traditions as well as me learning an earful about Sufism, Zaar rituals, Chabi dance music, and Electro-Chabi. Where we may have “cheated” a little bit is by occasionally slowing down or speeding up the tempo of the progression through the dataset so that at certain moments the dancers could sit more in one emotion or another or so that certain stretches of time kind of accelerated or slowed down. This actually became quite a theme of the piece. How time seems to slow down or speed up depending on the specific intensity of emotions being explored. How a moment of joy seems to pass quickly when one has been waiting so long for it to come. Or how when one is waiting for change, it can seem like an eternity is passing. For us, the build up to pure joy was something we started to take as a metaphor for the trance-like dances practiced in the Sufi tradition where one dances themselves into delirium until they pass out and leave their body into the realm of pure spirituality. As one builds to achieve a long awaited goal, reality shifts slightly, but nobody really knows what is on the other side of that shift. When you come back to earth, and the euphoria begins to wear off, you can see something has changed, but often times it is difficult to define what that is. It is often really more something internal within oneself rather than a concrete outward shift. It was this shift we were trying to capture musically. As joy fades, and the unity it brought begins to fragment, the sound of the city comes back and finally envelopes the space. What is left is just the fragmented memory of what brought you to that place of unity. This seems to be the common thread of may of these social movements. Weather a tangible goal was achieved or not, the thing that everyone took from those moments was the sense of purpose and unity that they had for a moment. So after months and months of trying to make a computer be the perfect DJ (which, by the way, took two human beings a very long time to accomplish) we then began to reflect on the material we had been using in a very different way. In February of this year, Ahmed visited Chicago and we huddled into the warmth of a studio at Columbia College to re-visit all of this material after having had almost a year away from it since finishing our Cairo residency in March of 2017. It was a very different experience from Cairo as we were cloistered in the coldest part of winter in a studio in Chicago only to travel later to an even more quiet and remote location at Bates College where we did a week long teaching residency with Erica. We decided to just freely improvise using our various tools. He with an Ableton Live session, and me with a MAX patch. The results were a series of short free improvisaitons that explored all the materials in different contexts than they had been presented and played by the “dataset”. Sort of an aftermath. A reflection. Overlaid with a series city soundscapes that were then manipulated and filtered by the dataset, we managed to create something a bit more sparse, introspective, and in a way, fulfilling. Just as these social movements experience extended periods of waiting before major events bring everyone together, so to is the period of reflection after they have run their course. Sometimes it feels like nothing changed. But under the surface, something else is brewing. I guess we have that in common right now (Egyptians and Americans). We had a moment, and it passed. And now we are just waiting to hear what comes next. One of the more obvious memes being explored in the piece is the importance of social media and the cell phone as a tool of resistance. So we paired ourselves with Tony and John who have been developing a show control based cell phone app called LAIT (later MoSho). Basically, it is an app that turns your phone into a multi-media platform where content is pushed to your phone by a central server. 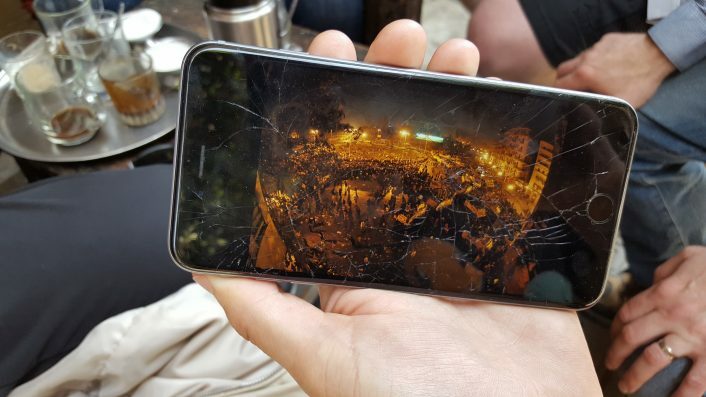 Images can be show, sounds played, animations triggered, and interactive features such as sending text messages and “seifies” to the server that are later displayed as a part of the piece. Though we fantasized about all the different things that could possibly happen between the phones, the audience, the sound score, and the projections, we knew that all of those ideas would eventually get too complex and muddy and not serve the piece as well as overly taxing the audience with “tasks” while they are there to watch a show. Having had vast experience actually making work with the platform, Tony and John were instrumental in guiding the process and asking the right questions about when to slightly pull back or pair down a particular idea so as not to make the intersections of the phone into a distraction. Better said, they helped to work out strategies that would bring attention to the phones at the appropriate times and create a counterpoint between the different elements. Sometimes the show is about the phones, sometimes it is about the dance, sometimes the projections and sound, and at other times, about a little bit of all of the elements. One can kind of think of the phones, projections, sound, dancers, as the different “sections” of an orchestra and the software that allows all of these sections to work together as the conductor. At almost every moment in the piece, some element of one “section” is playing a duet with another. Dancers control the sound, texts from the audience fill the screens with content, an interactive auralization of the dataset triggers both sounds of bells, chimes, and fence posts, but also sends triggers that play short animated videos. So many more things that work in tandem throughout the piece. It is like an orchestra of interdependence. During the Chicago performances, Ahmed and I even actually for a moment, becomes live “DJ’s” (like I said, we both hate that name) playing along with our sound score to give greater life to a social gathering where the audience itself becomes the dance as instructed by the phone. As you can imagine, this system is complex. But also apparent is the fact that there is no separation between the different parts. If one aspect of the piece goes wrong, the whole thing can fall apart. At any moment, there are at least 2 pieces of technology (and two or more human beings who are responsible or performing that technology) that have to both be working properly together. Sometimes a missed button or flubbed cue in one part of the piece can cause a chain reaction of missed cues in video, sound, or on the phones themselves. Then there are the typical human and environmental elements. If the internet is slow, the phones might not react right away or even crash. This causes confusion as the process of getting back online can require more steps than one things should take. The cameras that track the dancers movement to control the sound can also be a variable from night to night as slight fluctuations in light, the height of the cameras, and the dancers energy can make them react differently from performance to performance. I actually find while performing this piece that I really need to “warm up” with the dancers. Kind of like doing my stretches, but more for my hand/ear/eye coordination as I have to adjust several different parameters during the dancers performance under the cameras. I am also controlling most of the cues at this point as all the computers are talking to each other and almost every cue has some element of sound or video that needs to be taken simultaneously. This means I have to gauge the mood and tempo of the audience as they enter the space and begin to ask questions and interact with the phones. We are already looking into ways that someone form the stage who is actually inside the group can advance some of the cues manually with their phone so as to follow the flow of the audience. This is actually not about “holding the house” in this case, but more the beginning of the actual piece. As with many technological experiments, not everything goes right every night. But the piece itself has a cohesion at this point that never lets it die, even when things go wrong. Setbacks occur, but if you don’t panic, and you persevere, you will get to that other side of joy. When the people come together in solidarity, and everyone crosses over into the joy of the moment, it is easy to forgive the small failures that are peppered along the way. The process of discovering the way and getting to that essential place is far more important than everything being perfect. Things are not always perfect in life. Finding ways to deal with imperfection is the thing that actually brings us together. In a way, it is the thing that gives us freedom. Sometimes the drive for perfection pulls us farther and farther away from what we are trying to see. I find in the arts, there is nothing more distracting than the constant fear of failure. This fear kills great ideas. This fear squelches free thought. The sign of a great artist is the ability to overcome adversity in the moment as well as the ability to perfect their craft. Performance is a moment. What one learns from the challenges and difficulties of one performance is the meat of what bubbles under the surface for the next one. One would hope that social movements that failed, or ones that succeeded but then fragmented and fizzled out, would also have the chance to go underground and learn this lesson. And perhaps what changes a performer during a challenging performance is similar to what changes a society or group of people during a challenging moment in history. 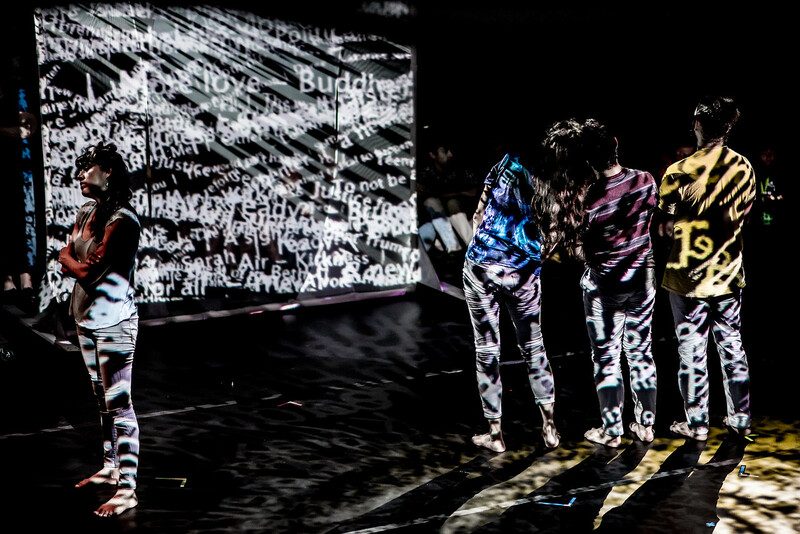 Every performance of Mycelial has been a great challenge. But also has been a great source of joy as in the end, so many things that had not been tried before succeeded to work together. So many disparate parts joined in a single whole. In the end, the various species of technological plants that have grown in the forest floor have grown a Mycelial layer and that connection always makes the forest stronger.